Yesterday, we abandoned our tradition of a grand Friday breakfast at home in favor of the breakfast at Baker and Spice and the Friday Farmer's Market. And we were NOT disappointed. I ordered blueberry pancakes and they were divine. These pancakes were just about the fluffiest, lightest pancakes I've ever had! They were more like moist cake! And the best part is that it wasn't that sweet. The blueberry compote and the fresh cream served with it was amazing and added the sweetness to it. 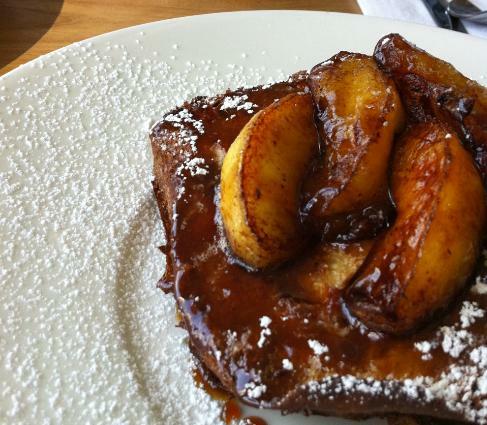 We also ordered a French toast with sour apples to share and weren't disappointed either. The bread was thick and crispy and the apples added a lovely contrast to the sweetness of the cake. Both the pancakes and the French toast were dusted with icing sugar- which got all over my clothes! So that wasn't the great part about it. After breakfast, we walked over to the farmer's market and just at that time the sun was overcast by the clouds and the Dubai Fountain started dancing and spraying water droplets on us! It was perfect! Although if I'm not mistaken foods grown with fertilizers are supposed to LOOK better and more attractive than organic food- I found this to be quite the opposite! The tomatoes on sale (as you can see in the photograph) look SO much better and riper than the non-organic tomatoes I usually buy at the supermarket- and they're BOTH local. I wanted to buy a sheep but didn't manage to do that because they hadn't brought any that day. And in case you're wondering, I want the sheep as a pet. Can't believe I haven't been there yet! Good photos - don't tell me they were all taken with the little point-and-shoot? 2. Do you know if the carry low-carb options? Not sure actually! I think their dough is lower in carbs than other pizza doughs but I'm not a 100% certain.